From babies at homes to the technocrats in corporates, SagitaZ has sculpted Zoho for a diverse audience. 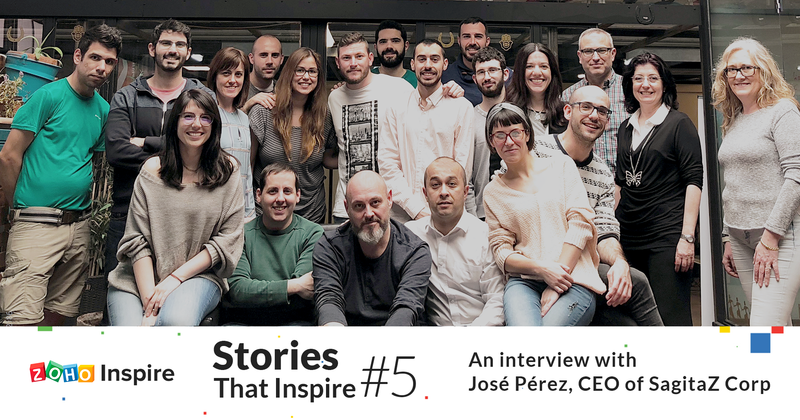 In this episode of Stories That Inspire, we bring on board, José Pérez, CEO of SagitaZ and a Zoho MVP. He tells us how he overcame linguistic barriers to build a customer base that increased his sales metrics by 60%. Read along to understand how he’s managed to juggle his leadership roles between his consultancy company and business school. Adhya: Hello, José. 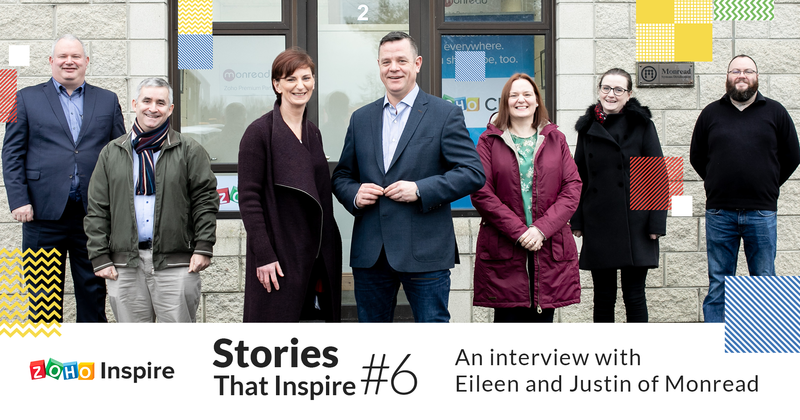 Welcome to Stories That Inspire! To begin with, walk us through your professional journey before SagitaZ. José: When I was young, I wanted to be a school teacher, but my mom wanted me to study engineering. So, I decided to be an industrial engineer focused on automation. My first job was to teach electrical workers how to incorporate automation into houses and machines. After that, I worked as a robot programmer, factory manager, sales director, and a university teacher. None of these have any relation to the field I am currently working on—IT, cloud, or digital technologies. 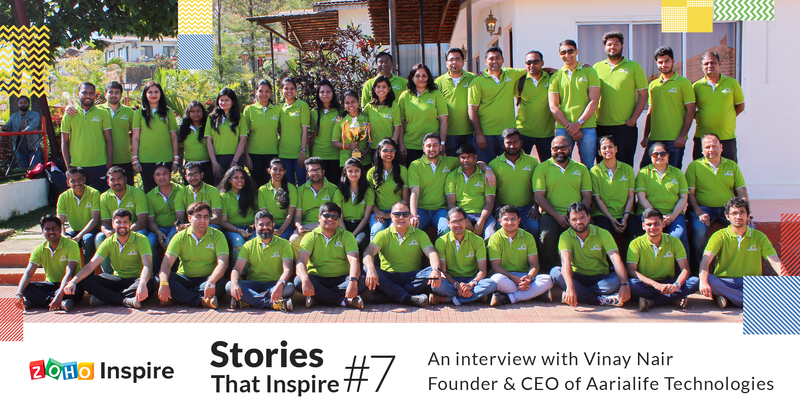 Adhya: So what inspired you to set up SagitaZ in the SaaS market? José: In 2009, during my stint as a sales manager, I was looking for a scalable CRM. After some detailed study, I found Zoho. My next search was for a good consultant, an expert in Zoho and—even better—in business development. However, I didn’t find anyone who I really loved, and moved on to set up the CRM myself. This sparked my mind to think beyond what I was already doing. A year later, in 2010, I made a choice—a decision to build my own company—and SagitaZ was born! “Sagita” means arrow in Latin and the “Z” comes from Zoho. We are here to help people pick the right SaaS market, just like how the arrow directs you to the correct path. Adhya: You founded SagitaZ in 2009. How did your relationship with Zoho begin? José: At that time, it was quite simple. I connected with Zoho to sell Zoho Creator. It was a product for geeks, so creating great solutions, having good case studies, and getting experience was our priority rather than doing big sales. Adhya: Wow! The name speaks for what you do as a firm. So, you’ve worn multiple hats—an engineer, a teacher, head of sales, CTO, CEO and finally, a founder. How have all of these experiences prepared you for SagitaZ? José: In 2009, Spain was entering into the worst financial crisis that we had lived through. I started the company with a vision: “put your customers ahead of all”. SagitaZ is a company with the same problems, fears, and doubts as all our customers. But, having worked on the “other side” of the wall in a lot of different places has helped me to empathize with the customer. So, most of the time, I’ve always got something in common with my client. This is the first step in building a rapport with a customer and understand them better. Adhya: How did you go about marketing your brand and landing your first 5 clients for the partnership? José: Mexico, Argentina, USA, Spain, and Colombia were the first countries we started to work in. In the beginning, we focused our work around Zoho Creator developments. We started with some videos about the product and moved on to creating our own Zoho Creator manual in Spanish. This proved to be a breakthrough in our market. The best thing about being a consulting company is that you really need not sell everyday, especially if you invest in the growth of your customer. Subsequently, customers will come back to you and when the word spreads, your business grows! Adhya: If you had to start today, is there anything that you might do differently? What has changed today? José: When I founded the company, I was single, so working 12 hours a day was not a problem at that time. Today, if I had to make a fresh start with my wife and baby, I probably wouldn’t focus on consulting to the SME market alone and look at widening our horizons. Adhya: What is your approach towards SaaS consulting? José: The customer is confused. They want to move to the cloud environment, work in the cloud, and build a business on the cloud. Yet, they’re apprehensive about the consultant’s work, and look for a standard solution that would work perfectly when customized to his needs. Usually, this is not possible. So, my personal advice to the owners of companies is not to tread the SaaS pathway without a good consultant company next to you. Migrating to the cloud is not merely about the tools, servers or computers; it is about the love, passion and expertise that a consultant brings to the table. Adhya: SagitaZ is a complete package! You’re into business, consulting, trainings, and events. How is your team equipped to handle this workload? José: Are you asking for a job? Haha. We are a team of thirty, now. This 2019, we’re planning to grow, because the only way to deliver quality work is by hiring passionate people who love other people—our customers. Adhya: How do you train and motivate your own people? José: I believe in leading by example. Four years ago I didn’t speak English, and it limited the possibilities of expanding the company to new markets. I decided to make a change to overcome this. So, I hired English-speaking workers and lived in my home amongst foreigners. Now, things have changed! My vision is that if I fight against my limits, my close team will naturally be aligned with the same way of living. Did you know that when we bring the Indian team to our HQ, they live in the homes of our local workers to grow a personal connection? Adhya: That’s a great way to build not just relationships but the business network as well! Having been in the SaaS arena for almost a decade, you naturally have your own theories on the market trends. What’s an interesting trend that you’ve observed over these years? 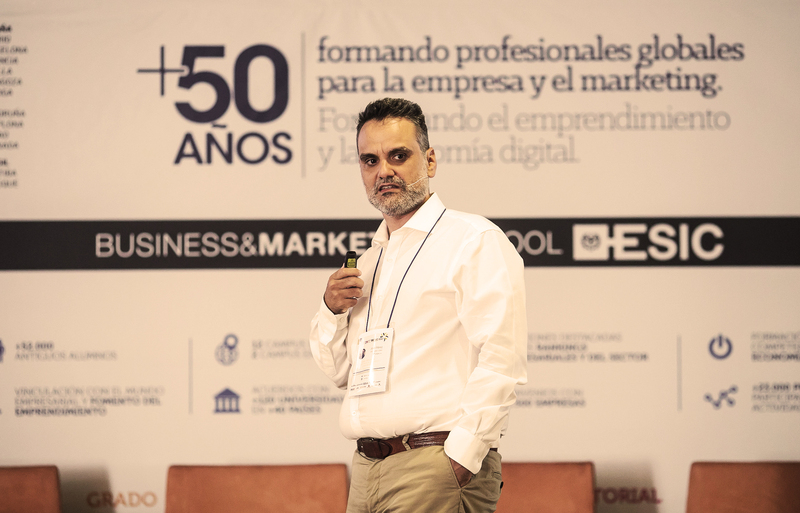 José: The companies still haven’t understood what it means to digitize their firm. They have started to use the cloud, but in the same way that they started using their first CD with Microsoft Office and Windows98. The work on digitalization will increase over time, but this is not enough. The greater challenge is to transform the way that the workers think. We need to create opportunities for young minds to gain business experience, while the seniors develop an understanding of what to expect from the new tools. Adhya: How do you grow your business (i.e. invest) while also generating cash flow? José: If there is money, we invest in new people. If not, we wait. This is what we’ve been doing all the while—maximizing the impact of every euro we sell. The secret to growth is, “don’t stop walking”. If you walk and walk, say, for almost 10 years, you can probably cover the globe. Don’t you think? Adhya: Oh yes! What were the lessons that you’ve learnt during your walk for growth? José: I have learned that the secret to success in the Zoho world is to have a great, big, and passionate team. Zoho’s cloud is massive, and any consulting company that wants to offer a good service has to have workers with years of experience. The complicated thing here is not about finding a solution; it is about figuring out the best solution from all the different points of view, like cost, maintenance, scalability, simplicity, UI/UX, and many more. Adhya: What are some ways that a partner can win the customer’s confidence and have them coming back to you? José: The most important thing is the customer’s needs. If a partner gives his 100% focus to his customer, the customer will feel that it’s a good relationship that has to be treasured for a long time. Let me give you one example: Eight years ago we started to develop an ERP for a textile factory in Mexico with Zoho Creator. This was a rewarding solution with more than one million rows of script. Now there is a video, case study, and a lot of interviews about this work of ours, but our value comes from the fact that the owner of this company, Richard Davis, is still our customer and a great friend! Adhya: That’s great! Could you brief us about one of your most challenging experiences in this journey? José: Like I told you before, I couldn’t speak English because when I went to school in Spain, we used to study French in those years. I felt that this was a big barrier to grow the company, because 50% of our customers speak English. Also, SagitaZ is 100% focused on the Zoho world, so as a CEO, I needed to have personal relations with Zoho guys in India and the USA. This seemed to be a bigger challenge at first, but this too was overcome after hours of great meetings with Mani and Sridhar Vembu, when I visited the Zoho office in Chennai last year. We now share a personal bond! Adhya: How do you position Zoho against a more well-known competitor? José: To us, this is simple: the customer wants us for what we do with Zoho, so we only focus on solving the needs of the customers. We never compare Zoho with other software. We only talk about how we can come up with a customized solution at the earliest they can expect, and this does the magic for us! Adhya: In 2018, you were named a Zoho MVP! How have your priorities changed since then? José: Becoming a Zoho MVP was great news for me and my team! It was a new position that pushed us to do different activities to promote Zoho to a huge community. We’ve been coming up with new ideas ever since. Our imagination knows no limits now! Have you seen our latest series of books for Zoho Babies? They are cool books for #zoholovers that we launched some months ago. Adhya: New titles bring in new responsibilities. 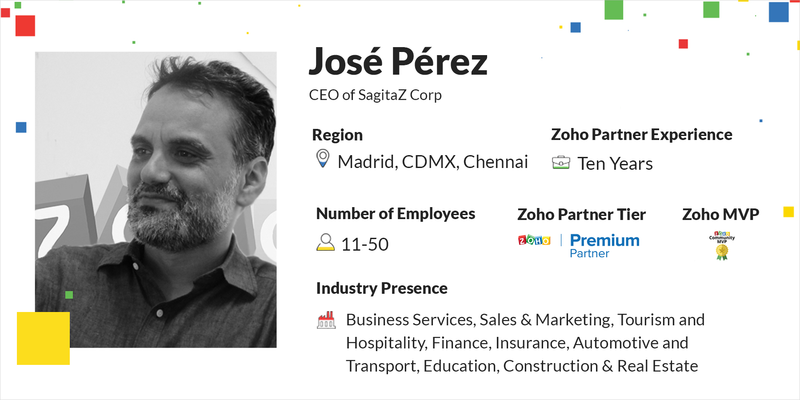 SagitaZ is now a Zoho Premium Partner in Mexico and Spain. How has your journey been for the last decade? José: From the beginning of our history, I had the idea of becoming a Global Tech Partner for our customers, because if we wanted to inspire them, we had to expand our horizons. This powered us to bring the company to Mexico in 2016. We were hiring new teams in India or travelling to Asia and Africa, looking for new business. 2018 was a year of hard work and dedication to improve our operations and complete the team. Adhya: What are your priorities for 2019? José: 2019 will be our year to work in new business units. Our biggest priority for this year is to let the team grow. To achieve this, I’ll have to start delegating my routine work outside of my own position. In 2018, our sales increased by almost 60%! The company is in good health and I feel this is the right time for me to expand and showcase our expertise in other countries, products and business units. Adhya: That’s great! We know that CRM is your primary focus. Are you looking to solve other customer issues through other products? José: The CRM is the building. Everything else is around CRM. We have consultants and expertise in all the Zoho applications. For example, our finances wing alone has three consultants, so we can do at least one or two finance projects every month. Marketing, Sales, Support, and every other product of the Zoho catalogue—if Zoho sells it, we have to be experts in it. This is the vision of the company. Adhya: SagitaZ has already touched parts of America and Europe with offices in Mexico, France, and Spain. Are you looking to add on new customers, or focus on expanding your presence within the current customers? José: SagitaZ is a service company. If our customers open an office in, say, Africa, we should be close to them. That is where we have a future. Right now, we’re just getting started. Adhya: What size of business do you typically serve? What skills does it take to serve larger customers? José: We typically serve multinational companies with a lot of needs. We also cater to the big local companies. Our clients want a solution that integrates multiple areas. At this point, we have to be agile and efficient. Our clients’ companies are already functional, and they want to have a solution as soon as possible, because a solution means more efficient processes and cuts on their expenditures. The point is to have a clear objective and go for it! Adhya: Great! SagitaZ has also been doing a lot more than consultancy services. The Zenith School, Spotfone VoIP, and other spin-offs. What’s the idea behind these initiatives and how did you go about finding the right resources for the program? José: We work based on the needs of the customers. The Zenith School was born to help our customers develop a deeper understanding of how to create what they want using Zoho tools. The telephone VoIP company was an idea that sparked when we were looking to build a solution for sales teams because the existing ones didn’t have the features that we needed.